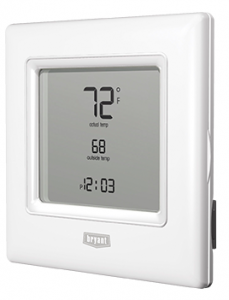 Designed for use with a Bryant® Hybrid Heat® dual-fuel system, this Bryant® Preferred™ Programmable thermostat offers an attractive, slim design to enhance any room. Programming is a snap — you can plug the optional ExP® memory card into your computer’s USB port, or open the face and use the easy-to-understand buttons. Then, sit back and enjoy the comfort as your system selects the optimal heating source for efficient, winter comfort along with humidity-sensing ability all year long.